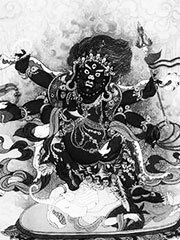 Mikkyō (密教; literally «secret teachings», often translated as «esoteric Buddhism») is a Japanese term that refers to the esoteric Vajrayana practices of the Shingon Buddhist school and the related practices that make up part of the Tendai school. Also the various Shingon and Tendai influenced practices of Shugendo. The practice of «three secrets and blessings» by all sentient beings in accordance with the law can make the «three professions» of body, mouth and meaning clear, and correspond to the body, mouth and meaning of the Buddha, that is, become a Buddha.